It’s never been easier to purchase windows or doors thanks to our excellent finance and payment options. Don’t put your home improvement project on hold, spread the cost of your new double glazing, windows, doors or conservatory. Enjoy the benefits of high quality products right now with our flexible and affordable finance options. Be in control of the term and interest paid with our low interest credit option – no hidden fees. Our double glazing on finance scheme is tailored to you and provides you with a payment plan that is realistic and doable. We are proud to offer this flexible payment option to our customers. We offer products to suit a wide range of products and like to reflect this in our payment options also. *Credit is subject to status. Current rates as at February 2018. If you have bad credit and are unable to take out a loan to cover the costs of your project then our finance packages offer the perfect solution. Our helpful payment plans allow you to get that home improvement you’re after, without the need for a large loan. You can choose us with confidence. At SWD Essex, we are authorised and regulated by The Financial Conduct Authority. As a credit broker not a lender, we offer credit facilities from a panel of lenders. Why Have Double Glazing On Finance? There are many reasons why a homeowner would choose to spread the cost of double glazing. Most of us don’t have access to large sum of money and are unable to pay upfront. This is often the main cause of home improvements being put on hold. With our double glazing on finance, you can get your project started straight away. Enjoy the home comforts sooner rather than later. We don’t always have the money upfront to replace our windows and doors. When it comes to emergency replacements, choosing a finance option such as a buy now & later scheme can be your saving grace. Finance options offer a simple and affordable solution, allowing homeowners to make improvements to their home without having to pay upfront. Choose from a beautiful range of uPVC windows including casement windows, sash windows, tilt and turn windows and French casement windows. Traditional style property? Our sash windows allow you to maintain that period aesthetic. After something more contemporary? Our tilt and turn windows will give help provide that modern edge. In recent years, many homeowners have taken to renovating and updating their properties rather than moving to larger homes. A well-designed extension in the form of a conservatory for example, can add lots of value. It’s more affordable and makes sense to add value to a current investment. We offer a wide range of conservatory styles. Our conservatory extensions are designed to suit any property, whether you opt for a Victorian, Edwardian, Lean-To, Gable-End or P-Shaped Conservatory design. Talk to one of our experts today. You can use our double glazing finance and payments to help fund your home renovations. Our double-glazing finance options make these choices all possible and allow you to immediately benefit from a stunning property transformation. Double glazed windows provide better insulation for your home, as well as keeping your home more secure and protected from outside elements. Investing in double glazed windows or doors will help you to maintain a warm and comfortable home all year round. Whatever home improvement solution you opt for, you can have peace of mind in choosing SWD Essex. We have many years of experience in the industry and are knowledgeable staff can give advice and recommend the best products and services for your home. If you choose one of our double-glazing options, you can spread the cost of your repayments without financial difficulty. 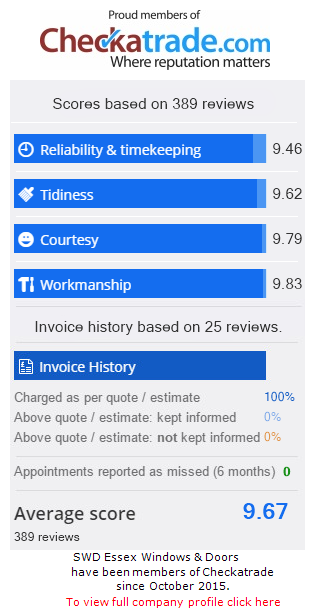 We believe in being honest and transparent, so you can be assured that are no hidden fees. You can choose the payment plan that best suits your requirements. Every homeowner in Essex could enjoy beautiful home improvements using our double glazing on finance payment plans. With many years of knowledge and experience within the home improvement industry, you can entrust us with your renovation. Choose a company that’s passionate, choose SWD for a fantastic result every time.